James Beckwourth, a mulatto, was born at Fredericksburg, Virginia, on 26th April, 1798. When he was a child his family moved to St. Charles, Missouri. Beckwourth became a blacksmith but on 13th February, 1822, William Ashley placed an advertisement in the Missouri Gazette and Public Adviser where he called for 100 enterprising men to "ascend the river Missouri" to take part in the fur collecting business. Those who agreed to join the party included Beckwourth, Tom Fitzpatrick, William Sublette, David Jackson, Hugh Glass, James Bridger and Jedediah Smith. Ashley's company was the first to depend primarily upon trapping the beaver rather than buying them from Native Americans. Ashley did not pay the trappers a fixed wage. Instead, in return for transporting them to the Rocky Mountains, he took a share in the furs they obtained. Beckwourth became an established mountain man and trapped the upper Missouri and Columbia region. In 1828 he began living with the Crow. He adopted Native American customs and it is claimed he married several squaws. In 1835 Beckwouth joined an expedition to California. He also visited Florida where he took part in the Seminole War and fought under Zachary Taylor at Lake Okeechobee. On 24th January, 1848, James Marshall, discovered gold on land owned by John Sutter in California. By 1849 over 100,000 people had joined the Californian Gold Rush. This included Beckwourth but after failing to make his fortune he returned to St Louis. 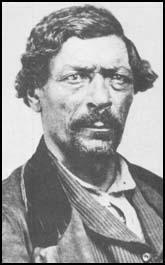 In 1852 Beckwourth began dictating his memoirs to the journalist Thomas Bonner. The book, The Life and Adventures of James P. Beckwourth was published in 1856. Beckwourth eventually returned to living with the Crow. He trapped beaver at Green River until his death in 1866.